The picture on the left depicts the first headstones that were placed in the cemetery during the Civil War. Since then, many of the headstones have been replaced. The picture on the right shows how these headstones look today. Headstones are an important part of cemeteries, serving to mark a person’s grave site and memorialize the life of the deceased. Historians and genealogists benefit from this tradition because they can use headstones as historical sources to learn more about the life of the departed. 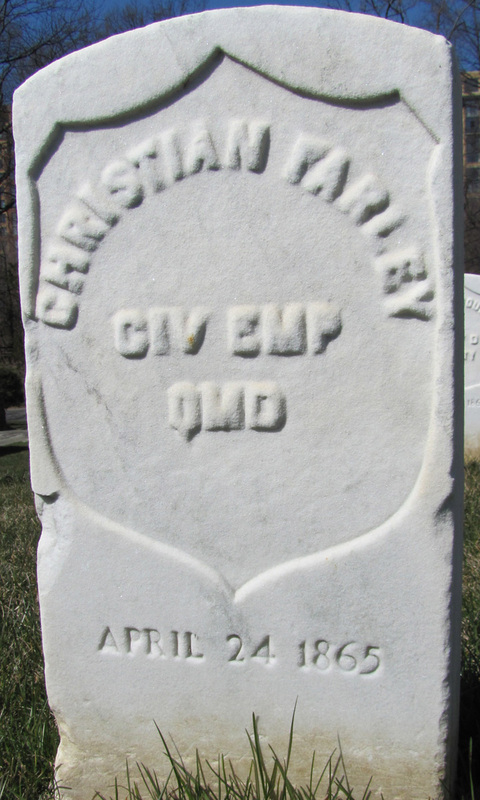 Take a closer look at what is written on Christian Farley’s gravestone. “CIV EMP QMD” indicates that these men were civilian employees of the Quartermaster Department, a branch of the U.S. Army which provided and coordinated food, fuel, supplies, transportation and logistics. Why might a civilian be buried in a military cemetery? What events were happening in the country in April 1865?